“Methanal” redirects here. It is not to be confused with Methanol or Menthol. In view of its widespread use, toxicity, and volatility, formaldehyde poses a significant danger to human health. In 2011, the US National Toxicology Program described formaldehyde as “known to be a human carcinogen“. When dissolved in water, formaldehyde also forms a hydrate, methanediol, with the formula H2C(OH)2. This compound also exists in equilibrium with various oligomers (short polymers), depending on the concentration and temperature. A saturated water solution, of about 40% formaldehyde by volume or 37% by mass, is called “100% formalin“. A small amount of stabilizer, such as methanol, is usually added to suppress oxidation and polymerization. A typical commercial grade formalin may contain 10–12% methanol in addition to various metallic impurities. The name was genericised long ago from an old trade name, “Formalin”. HCN, HNC, H2CO, and dust have also been observed inside the comae of comets C/2012 F6 (Lemmon) and C/2012 S1 (ISON). The safety of formaldehyde is very complicated. It occurs naturally and is “an essential intermediate in cellular metabolism in mammals and humans.” It is not acutely toxic as ingestion of many milliliters is tolerated. The main concerns are associated with chronic (long term) exposure by inhalation. This may happen through three main sources: thermal or chemical decomposition of formaldehyde-based resins, emission from aqueous formaldehyde solutions (i.e. embalming fluids), and the production of formaldehyde resulting from the combustion of a variety of organic compounds (for example, exhaust gases). As formaldehyde resins are used in many construction materials it is one of the more common indoor air pollutants. At concentrations above 0.1 ppm in air formaldehyde can irritate the eyes and mucous membranes, resulting in watery eyes. Formaldehyde inhaled at this concentration may cause headaches, a burning sensation in the throat, and difficulty breathing, and can trigger or aggravate asthma symptoms. A 1988 Canadian study of houses with urea-formaldehyde foam insulation found that formaldehyde levels as low as 0.046 ppm were positively correlated with eye and nasal irritation. A 2009 review of studies has shown a strong association between exposure to formaldehyde and the development of childhood asthma. The primary exposure concern is for the workers in the industries producing or using formaldehyde. The formaldehyde theory of carcinogenesis was proposed in 1978. In 1987 the U.S. EPA classified it as a probable human carcinogen, and after more studies the WHO International Agency for Research on Cancer (IARC) in 1995 also classified it as a probable human carcinogen. Further information and evaluation of all known data led the IARC to reclassify formaldehyde as a known human carcinogen associated with nasal sinus cancer and nasopharyngeal cancer. 2009 and 2010 studies have also shown a positive correlation between exposure to formaldehyde and the development of leukemia, particularly myeloid leukemia. Nasopharyngeal and sinonasal cancers are relatively rare, with a combined annual incidence in the United States of < 4,000 cases. About 30,000 cases of myeloid leukemia occur in the United States each year. Workplace exposure to inhaled chemicals is among the most important risk factors for sinonasal cancers. [not in citation given] Professionals exposed to formaldehyde in their occupation, such as funeral industry workers and embalmers, showed an increased risk of leukemia and brain cancer compared with the general population. Other factors are important in determining individual risk for the development of leukemia or nasopharyngeal cancer. The United States Environmental Protection Agency (EPA) allows no more than 0.016 ppm formaldehyde in the air in new buildings constructed for that agency. [not in citation given] A U.S. Environmental Protection Agency study found a new home measured 0.076 ppm when brand new and 0.045 ppm after 30 days. The Federal Emergency Management Agency (FEMA) has also announced limits on the formaldehyde levels in trailers purchased by that agency. The EPA recommends the use of “exterior-grade” pressed-wood products with phenol instead of urea resin to limit formaldehyde exposure, since pressed-wood products containing formaldehyde resins are often a significant source of formaldehyde in homes. For most people, irritation from formaldehyde is temporary and reversible, though formaldehyde can cause allergies and is part of the standard patch test series. In 2005–06, it was the seventh-most-prevalent allergen in patch tests (9.0%). People with formaldehyde allergy are advised to avoid formaldehyde releasers as well (e.g., Quaternium-15, imidazolidinyl urea, and diazolidinyl urea). People who suffer allergic reactions to formaldehyde tend to display lesions on the skin in the areas that have had direct contact with the substance, such as the neck or thighs (often due to formaldehyde released from permanent press finished clothing) or dermatitis on the face (typically from cosmetics). Formaldehyde has been banned in cosmetics in both Sweden and Japan. The eyes are most sensitive to formaldehyde exposure: The lowest level at which many people can begin to smell formaldehyde ranges between 0.05-1 ppm. The maximum concentration value at the workplace is 0.3 ppm. [need quotation to verify] In controlled chamber studies, individuals begin to sense eye irritation at about 0.5 ppm; 5 to 20 percent report eye irritation at 0.5 to 1 ppm; and greater certainty for sensory irritation occurred at 1 ppm and above. While some agencies have used a level as low as 0.1 ppm as a threshold for irritation, the expert panel found that a level of 0.3 ppm would protect against nearly all irritation. In fact, the expert panel found that a level of 1.0 ppm would avoid eye irritation—the most sensitive endpoint—in 75–95% of all people exposed. Studies on the interactions between formaldehyde and proteins at the molecular level have been reported on the effects of the body’s carrier protein, serum albumin. The binding of formaldehyde loosens the skeletal structure of albumin and exposure of aromatic ring amino acids in the internal hydrophobic region. Symptoms may affect personal awareness, making one feel tired or fatigued. In June 2011, the twelfth edition of the National Toxicology Program (NTP) Report on Carcinogens (RoC) changed the listing status of formaldehyde from “reasonably anticipated to be a human carcinogen” to “known to be a human carcinogen.” Concurrently, a National Academy of Sciences (NAS) committee was convened and issued an independent review of the draft United States Environmental Protection Agency IRIS assessment of formaldehyde, providing a comprehensive health effects assessment and quantitative estimates of human risks of adverse effects. In the United States, Congress passed a bill July 7, 2010 regarding the use of formaldehyde in hardwood plywood, particle board, and medium density fiberboard. The bill limited the allowable amount of formaldehyde emissions from these wood products to .09 ppm, and required companies to meet this standard by January 2013. Formaldehyde was declared a toxic substance by the 1999 Canadian Environmental Protection Act. The United States Centers For Disease Control and Prevention (CDC) performed indoor air quality testing for formaldehyde in some of the units. On February 14, 2008, the CDC announced that potentially hazardous levels of formaldehyde were found in many of the travel trailers and manufactured homes provided by the agency. The CDC’s preliminary evaluation of a scientifically established random sample of 519 travel trailers and manufactured homes tested between December 21, 2007, and January 23, 2008 (2+ years after manufacture), showed average levels of formaldehyde in all units of about 0.077 parts per million (ppm). Long-term exposure to levels in this range can be linked to an increased risk of cancer and, at levels above this range, there can also be a risk of respiratory illness. These levels are higher than expected in indoor air, where levels are commonly in the range of 0.01–0.02 ppm, and are higher than the Agency for Toxic Substance Disease Registry (ATSDR, division of the CDC) Minimal Risk Level (MRL) of 0.008 ppm. Levels measured ranged from 0.003 ppm to 0.59 ppm. Scandals have broken in both the 2005 Indonesia food scare and 2007 Vietnam food scare regarding the addition of formaldehyde to foods to extend shelf life. In 2011, after a four-year absence, Indonesian authorities found foods with formaldehyde being sold in markets in a number of regions across the country. In August 2011, at least at two Carrefour supermarkets, the Central Jakarta Livestock and Fishery Sub-Department found a sweet glutinous rice drink (cendol) contained 10 parts per million of formaldehyde. In 2014, the owner of two noodle factories in Bogor, Indonesia; was arrested for using formaldehyde in noodles. 50 kg of formaldehyde was confiscated. Foods known to be contaminated included noodles, salted fish, and tofu. Chicken and beer were also rumored to be contaminated. In some places, such as China, manufacturers still use formaldehyde illegally as a preservative in foods, which exposes people to formaldehyde ingestion. In humans, the ingestion of formaldehyde has been shown to cause vomiting, abdominal pain, dizziness, and in extreme cases can cause death. Testing for formaldehyde is by blood and/or urine by gas chromatography-mass spectrometry. Other methods include infrared detection, gas detector tubes, etc., of which HPLC is the most sensitive. In the early 1900s, it was frequently added by US milk plants to milk bottles as a method of pasteurization due to the lack of knowledge regarding formaldehyde’s toxicity. In 2011 in Nakhon Ratchasima, Thailand, truckloads of rotten chicken were exposed to formaldehyde in which “a large network,” including 11 slaughterhouses run by a criminal gang, were implicated. In 2012, 1 billion rupiah (almost US$100,000) of fish imported from Pakistan to Batam, Indonesia, were found laced with formaldehyde. ^ a b “Front Matter”. Nomenclature of Organic Chemistry : IUPAC Recommendations and Preferred Names 2013 (Blue Book). Cambridge: The Royal Society of Chemistry. 2014. p. 908. doi:10.1039/9781849733069-FP001. ISBN 978-0-85404-182-4. ^ a b “SIDS Initial Assessment Report” (PDF). International Programme on Chemical Safety. Archived (PDF) from the original on 2019-03-28. Retrieved 2019-04-21. ^ Spence, Robert; Wild, William (1935). “114. The vapour-pressure curve of formaldehyde, and some related data”. Journal of the Chemical Society (Resumed): 506–509. “PubChem Compound Database; CID=712”. National Center for Biotechnology Information. Archived from the original on 2019-04-12. Retrieved 2017-07-08. “Acidity of aldehydes”. Chemistry Stack Exchange. Archived from the original on 2018-09-01. Retrieved 2019-04-21. ^ Nelson Jr., R. D.; Lide, D. R.; Maryott, A. A. (1967). “Selected Values of electric dipole moments for molecules in the gas phase (NSRDS-NBS10)” (PDF). Archived (PDF) from the original on 2018-06-08. Retrieved 2019-04-21. ^ a b c NIOSH Pocket Guide to Chemical Hazards. “#0293”. National Institute for Occupational Safety and Health (NIOSH). ^ NIOSH Pocket Guide to Chemical Hazards. “#0294”. National Institute for Occupational Safety and Health (NIOSH). ^ “Substance Name: Formaldehyde [USP]”. ChemlDplus, US National Libary of Medicine. Archived from the original on 2017-09-18. Retrieved 2019-04-21. ^ a b “Formaldehyde”. Immediately Dangerous to Life and Health Concentrations (IDLH). National Institute for Occupational Safety and Health (NIOSH). Harris, Gardiner (2011-06-10). “Government Says 2 Common Materials Pose Risk of Cancer”. New York Times. Archived from the original on 2019-03-28. Retrieved 2011-06-11. National Toxicology Program (2011-06-10). “12th Report on Carcinogens”. National Toxicology Program. Archived from the original on 2011-06-08. Retrieved 2011-06-11. National Toxicology Program (2011-06-10). “Report On Carcinogens – Twelfth Edition – 2011” (PDF). National Toxicology Program. Archived from the original (PDF) on 2011-06-12. Retrieved 2011-06-11. ^ National Research Council (2014). Review of the Formaldehyde Assessment in the National Toxicology Program 12th Report on Carcinogens (PDF). Washington, DC: The National Academies Press. p. 91. doi:10.17226/18948. ISBN 978-0-309-31227-1. ^ “Formaldehyde Is Biodegradable, Quickly Broken Down in the Air By Sunlight or By Bacteria in Soil or Water” (Press release). Formaldehyde Panel of the American Chemistry Council. 2014-01-29. Archived from the original on 2019-03-28. Retrieved 2017-04-22. ^ Zuckerman, B.; Buhl, D.; Palmer, P.; Snyder, L. E. (1970). “Observation of interstellar formaldehyde”. Astrophys. J. 160: 485–506. Bibcode:1970ApJ…160..485Z. doi:10.1086/150449. ^ Mangum, Jeffrey G.; Darling, Jeremy; Menten, Karl M.; Henkel, Christian (2008). “Formaldehyde Densitometry of Starburst Galaxies”. Astrophys. J. 673 (2): 832–46. arXiv:0710.2115. Bibcode:2008ApJ…673..832M. doi:10.1086/524354. ^ Woon, David E. (2002). “Modeling Gas-Grain Chemistry with Quantum Chemical Cluster Calculations. I. Heterogeneous Hydrogenation of CO and H2CO on Icy Grain Mantles”. Astrophys. J. 569 (1): 541–48. Bibcode:2002ApJ…569..541W. doi:10.1086/339279. ^ Zubritsky, Elizabeth; Neal-Jones, Nancy (11 August 2014). “RELEASE 14-038 – NASA’s 3-D Study of Comets Reveals Chemical Factory at Work”. NASA. Retrieved 12 August 2014. ^ Cordiner, M.A. ; et al. (11 August 2014). “Mapping the Release of Volatiles in the Inner Comae of Comets C/2012 F6 (Lemmon) and C/2012 S1 (ISON) Using the Atacama Large Millimeter/Submillimeter Array”. The Astrophysical Journal. 792 (1): L2. arXiv:1408.2458. Bibcode:2014ApJ…792L…2C. doi:10.1088/2041-8205/792/1/L2. Retrieved 12 August 2014. ^ Butlerow, A (1859). Ueber einige Derivate des Jodmethylens [On some derivatives of methylene iodide]. Annalen der Chemie und Pharmacie. 111. pp. 242–252. In this paper, Butlerov discovered formaldehyde, which he called “Dioxymethylen” (methylene dioxide) [page 247] because his empirical formula for it was incorrect (C4H4O4). A.W. Hofmann, (1868) “Zur Kenntnis des Methylaldehyds”, Annalen der Chemie und Pharmacie (Annals of Chemistry and Pharmacy), vol. 145, no. 3, pages 357–361. A.W. Hofmann (1868) “Zur Kenntnis des Methylaldehyds”, Journal für praktische Chemie (Journal for Practical Chemistry), vol. 103, no. 1, pages 246–250. Hofmann, A.W. (1869). “Beiträge zur Kenntnis des Methylaldehyds”. Journal für Praktische Chemie. 107 (1): 414–424. doi:10.1002/prac.18691070161. A.W. Hofmann (1869) “Beiträge zur Kenntnis des Methylaldehyds,” Berichte der Deutschen Chemischen Gesellschaft (Reports of the German Chemical Society), vol. 2, pages 152–159. ^ “Formaldehyde in Clothing and Textiles FactSheet”. NICNAS. Australian National Industrial Chemicals Notification and Assessment Scheme. 2013-05-01. Archived from the original on 2019-03-19. Retrieved 2014-11-12. ^ “Ingredients of Vaccines – Fact Sheet”. Center for Disease Control. Archived from the original on 2019-04-21. Retrieved 2018-08-04. Formaldehyde is used to inactivate bacterial products for toxoid vaccines, (these are vaccines that use an inactive bacterial toxin to produce immunity.) It is also used to kill unwanted viruses and bacteria that might contaminate the vaccine during production. Most formaldehyde is removed from the vaccine before it is packaged. ^ de Groot, Anton C; Flyvholm, Mari-Ann; Lensen, Gerda; Menné, Torkil; Coenraads, Pieter-Jan (August 2009). “Formaldehyde-releasers: relationship to formaldehyde contact allergy. Contact allergy to formaldehyde and inventory of formaldehyde-releasers”. Contact Dermatitis. 61 (2): 63–85. doi:10.1111/j.1600-0536.2009.01582.x. PMID 19706047. ^ Francis-Floyd, Ruth (April 1996). 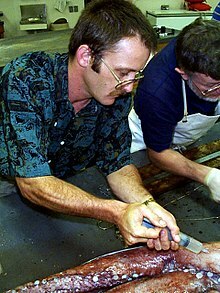 “Use of Formalin to Control Fish Parasites”. Institute of Food and Agricultural Sciences, University of Florida. Archived from the original on May 27, 2012. ^ “§573.460 Formaldehyde”. U.S. Government Publishing Office. 2019-04-19. Archived from the original on 2019-04-23. ^ Patel, Alkesh (2007-07-04). “Formaldehyde Ban set for 22 September 2007”. WebWire. Archived from the original on 2018-12-12. Retrieved 2012-05-19. ^ “European chemical Substances Information System (ESIS) entry for formaldehyde”. Archived from the original on 2014-01-01. Retrieved 2009-09-01. ^ “Process C-41 Using Kodak Flexicolor Chemicals – Publication Z-131”. Kodak. Archived from the original on 2016-06-15. Retrieved 2009-09-01. ^ “Medical Management Guidelines for Formaldehyde”. Archived from the original on 2019-04-23. ^ “Indoor Air Pollution in California” (PDF). Air Resources Board, California Environmental Protection Agency. July 2005. pp. 65–70. Archived (PDF) from the original on 2019-03-01. Retrieved 2012-05-19. ^ “Formaldehyde”. Occupational Safety and Health Administration. August 2008. Archived from the original on 2019-04-11. Retrieved 2009-09-01. “Formaldehyde Reference Exposure Levels” (PDF). California Office Of Health Hazard Assessment. December 2008. Archived from the original on 2019-03-23. Retrieved 2012-05-19. “Formaldehyde and Indoor Air”. Health Canada. 2012-03-29. Archived from the original on 2019-04-23. ^ Broder, I; Corey, P; Brasher, P; Lipa, M; Cole, P (1991). “Formaldehyde exposure and health status in households”. Environmental Health Perspectives. 95: 101–4. doi:10.1289/ehp.9195101. PMC 1568408. PMID 1821362. ^ McGwin, G; Lienert, J; Kennedy, JI (November 2009). “Formaldehyde Exposure and Asthma in Children: A Systematic Review”. Environmental Health Perspectives. 118 (3): 313–7. doi:10.1289/ehp.0901143. PMC 2854756. PMID 20064771. ^ Lobachev, AN (1978). “РОЛЬ МИТОХОНДРИАЛЬНЫХ ПРОЦЕССОВ В РАЗВИТИИ И СТАРЕНИИ ОРГАНИЗМА. СТАРЕНИЕ И РАК” [Role of mitochondrial processes in the development and aging of organism. Aging and cancer] (PDF) (in Russian). VINITI. Archived (PDF) from the original on 2013-06-06. ^ IARC Working Group on the Evaluation of Carcinogenic Risks to Humans (2006). IARC Monographs on the Evaluation of Carcinogenic Risks to Humans – VOLUME 88 – Formaldehyde, 2-Butoxyethanol and 1-tert-Butoxypropan-2-ol (PDF). WHO Press. ISBN 92-832-1288-6. Archived (PDF) from the original on 2018-07-12. ^ a b “Formaldehyde and Cancer Risk”. National Cancer Institute. 2011-06-10. Archived from the original on 2019-01-23. ^ Zhang, Luoping; Steinmaus, Craig; Eastmond, Eastmond; Xin, Xin; Smith, Smith (March–June 2009). “Formaldehyde exposure and leukemia: A new meta-analysis and potential mechanisms” (PDF). Mutation Research/Reviews in Mutation Research. 681 (2–3): 150–168. doi:10.1016/j.mrrev.2008.07.002. PMID 18674636. Retrieved 2013-05-22. ^ Zhang, Luoping; Freeman, Laura E. Beane; Nakamura, Jun; Hecht, Stephen S.; Vandenberg, John J.; Smith, Martyn T.; Sonawane, Babasaheb R. (2010). “Formaldehyde and Leukemia: Epidemiology, Potential Mechanisms, and Implications for Risk Assessment”. Environmental and Molecular Mutagenesis. 51 (3): 181–191. doi:10.1002/em.20534. PMC 2839060. PMID 19790261. ^ “Key Statistics for Nasopharyngeal Cancer”. American Cancer Society. Archived from the original on 2019-01-11. Retrieved 2019-04-22. ^ Turner JH, Reh DD (June 2012). “Incidence and survival in patients with sinonasal cancer: a historical analysis of population-based data”. Head Neck. 34 (6): 877–85. doi:10.1002/hed.21830. PMID 22127982. “Key Statistics for Chronic Myeloid Leukemia”. American Cancer Society. Archived from the original on 2019-04-23. Retrieved 2019-04-22. “What are the key statistics about acute myeloid leukemia?Key Statistics for Acute Myeloid Leukemia (AML)”. American Cancer Society. Archived from the original on 2019-04-23. Retrieved 2019-04-22. ^ a b “What are the risk factors for nasopharyngeal cancer?”. ^ Butticè, Claudio (2015). “Solvents”. In Colditz, Graham A. (ed.). The SAGE Encyclopedia of Cancer and Society (Second ed.). Thousand Oaks: SAGE Publications, Inc. pp. 1089–1091. doi:10.4135/9781483345758.n530. ISBN 9781483345734. ^ “Risk Factors for Acute Myeloid Leukemia (AML)”. American Cancer Society. 2018-08-21. Archived from the original on 2019-04-23. ^ “Risk Factors for Chronic Myeloid Leukemia”. American Cancer Society. 2018-06-19. Archived from the original on 2018-12-12. ^ Dales, R; Liu, L; Wheeler, AJ; Gilbert, NL (July 2008). “Quality of indoor residential air and health”. Canadian Medical Association Journal. 179 (2): 147–52. doi:10.1503/cmaj.070359. PMC 2443227. PMID 18625986. ^ “Formaldehyde Emission Standards for Composite Wood Products”. EPA. Archived from the original on 2018-12-24. Retrieved 2019-04-24. ^ Passmore, Whitney; Sullivan, Michael J. (2016-08-04). “EPA Issues Final Rule on Formaldehyde Emission Standards for Composite Wood Products”. The National Law Review. Womble Carlyle Sandridge & Rice, PLLC. Archived from the original on 2018-06-19. Retrieved 2016-08-24 – via Google News. ^ “Testing for Indoor Air Quality, Baseline IAQ, and Materials”. Environmental Protection Agency. Archived from the original on October 15, 2006. ^ Evans, Ben (2008-04-11). “FEMA limits formaldehyde in trailers”. Boston.com. Archived from the original on June 15, 2010. Retrieved 2008-09-04. ^ Zug KA, Warshaw EM, Fowler JF, Maibach HI, Belsito DL, Pratt MD, Sasseville D, Storrs FJ, Taylor JS, Mathias CG, Deleo VA, Rietschel RL, Marks J (2009). 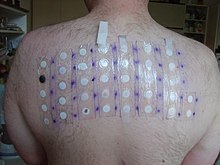 “Patch-test results of the North American Contact Dermatitis Group 2005-2006”. Dermatitis. 20 (3): 149–60. PMID 19470301. ^ “Formaldehyde allergy”. DermNet NZ. New Zealand Dermatological Society. 2002. Archived from the original on 2018-09-23. Retrieved 2019-04-25. ^ a b De Groot, Anton C; Flyvholm, Mari-Ann; Lensen, Gerda; Menné, Torkil; Coenraads, Pieter-Jan (2009). “Formaldehyde-releasers: relationship to formaldehyde contact allergy. Contact allergy to formaldehyde and inventory of formaldehyde-releasers”. Contact Dermatitis. 61 (2): 63–85. doi:10.1111/j.1600-0536.2009.01582.x. PMID 19706047. ^ Hayashida, Mike. “The Regulation of Cosmetics in Japan” (PDF). Archived (PDF) from the original on 2019-04-14. Retrieved 2019-04-25. ^ “Formaldehyde CAS 50-00-0” (PDF). United Nations Environment Programme. Archived (PDF) from the original on 2019-03-28. Retrieved 2019-04-25. ^ “European Union Bans formaldehyde/formalin within Europe” (PDF). European Commission’s Environment Directorate-General. September 2007. pp. 1–3. Retrieved 19 May 2012. ^ “ESIS (European Chemical Substances Information System)”. European Commission Joint Research Centre Institute for Health and Consumer Protection. February 2009. Archived from the original on 1 January 2014. Retrieved 19 May 2012. ^ “S.1660 – Formaldehyde Standards for Composite Wood Products Act”. OpenCongress. July 2010. Retrieved 19 May 2012. ^ “Health Canada – Proposed residential indoor air quality guidelines for formaldehyde”. Health Canada. April 2007. ^ Mike Brunker (2006-07-25). “Are FEMA trailers ‘toxic tin cans’?”. MSNBC. Retrieved 19 May 2012. ^ Kunzelman, Michael (2007-08-08). “Suit Filed Over FEMA Trailer Toxins”. The Washington Post. Retrieved 2010-05-02. ^ Brunker, Mike (September 28, 2012). “Class-action suit against FEMA trailer manufacturers settled for $42.6 million”. NBC News. Retrieved 11 September 2015. ^ Megan Terlecky (2008-10-24). “How We Tested for Formaldehyde”. KGAN-TV. Archived from the original on June 15, 2011. ^ “FEMA Trailers in Iowa Exceed Formaldehyde Levels Considered Safe”. Insurance Journal. October 23, 2008. Retrieved 16 September 2015. ^ Nigel Duara (2008-10-21). “FEMA disputes formaldehyde study of Iowa trailers”. Associated Press. Archived from the original on October 31, 2008. ^ Cindy Hadish (2008-10-24). “FEMA meets with mobile home residents over health concerns”. Cedar Rapids Gazette. Archived from the original on February 22, 2009. ^ “Formaldehyde-laced foods reemerge in Indonesian markets”. August 10, 2011. ^ “Formaldehyde-Tainted Rice Drinks Found at Carrefour Markets”. August 22, 2011. ^ “BPOM Uncovers Two Formaldehyde-Tainted Noodle Factories in Bogor”. October 12, 2014. ^ Xiaojiang Tang et al., “Formaldehyde in China: Production, consumption, exposure levels, and health effects (PDF)“, Environment International 35 (2009): 1215–16, and other references cited on p. 1216; see also “Municipality sees red over bad blood processing” (2011-03-18, China Daily, online English edition; retrieved on May 17, 2011). ^ Moise Ngwa (2010-10-25). “formaldehyde testing” (PDF). Cedar Rapids Gazette. Retrieved 19 May 2012. ^ “Was Death in the Milk?”. The Indianapolis News. July 31, 1900. p. 5. Retrieved August 20, 2014 – via Newspapers.com. ^ “Wants New Law Enacted. Food Inspector Farnsworth Would Have Use of Formaldehyde in Milk Stopped”. The Topeka Daily Capital. August 30, 1903. p. 8. Retrieved August 20, 2014 – via Newspapers.com. NIOSH Pocket Guide to Chemical Hazards. “#0293”. National Institute for Occupational Safety and Health (NIOSH). Formaldehyde Added to “Known Carcinogens” List Despite Lobbying by Chemical Industry — video report by Democracy Now! So you’re living in one of FEMA’s Katrina trailers… What can you do?